First in a series of profiles on the seven men to be ordained priests for the Archdiocese of Philadelphia on May 18. If 10 years or so ago someone had predicted to David Buffum that he would enter a seminary and be ordained a priest on May 18, 2019, he probably would have asked what they were drinking. The only child of Glenn and Mary Buffum grew up in Springfield, Delaware County. After completing the lower grades at St. Kevin School and then E.T. Richardson Middle School and Garnet Valley High School he went on to Temple University. After college, with a degree in film, Buffum relocated to New York and began a career with TD Bank in Manhattan. He was living in Brooklyn, simply enjoying life — dating, partying with the crowd. For a while he was vegetarian, ethically opposed to killing animals, but going to church was not part of his equation. Yet something was wrong. He knew it and others sensed it too. It happened when he was in his late twenties, he recalls. But he did go back when it was open. He went to confession for the first time in 15 years and not only returned but became very involved in his parish, St. Anselm in the Bay Ridge section of Brooklyn. As a former lapsed Catholic, his coming home was accompanied with the fervor of a convert. When the idea to enter the seminary first came to him, “the decision was not easy,” he said. “I really had to think about it. I was being pulled toward it. I didn’t know how to do it and at first I didn’t contact anyone,” he recalls. When he finally made his decision to enter the seminary, most of his friends were shocked. They didn’t even know he had started going back to church. His family was not surprised because they noticed him going to church during his visits home. He entered pre-theology at a seminary for the Brooklyn Diocese in 2011, with the intention of becoming a priest for that diocese. But he would come back to his parents’ home during breaks and attended daily Mass at Our Lady of Perpetual Help Parish in Morton. At the parish Father Richard Smith noticed him praying from a breviary every day and asked him about it. When he explained he was a seminarian, Father Smith introduced him to the pastor, Msgr. John Savinski, who suggested Buffum help at the parish whenever he was home. He did, serving Mass, making Communion calls, little things. 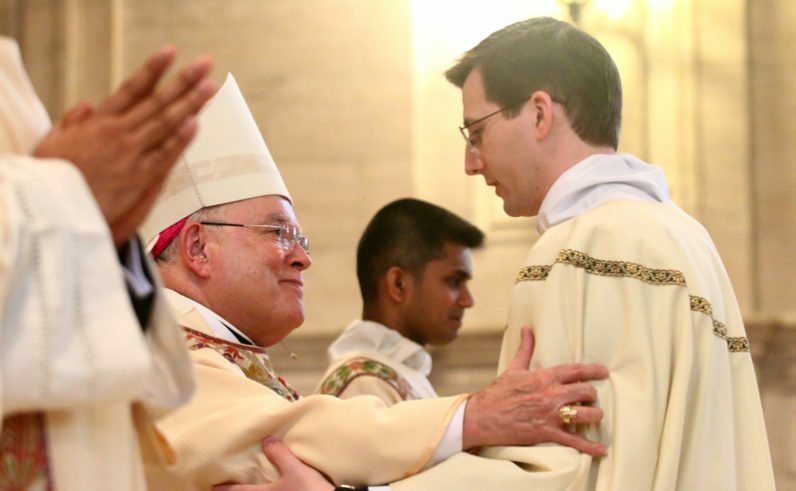 “I started to get more of a sense of the Philadelphia Archdiocese and that’s why I transferred” and entered St. Charles Borromeo Seminary, he said. Transitions always have challenges. The New York lifestyle to which he was accustomed is a lot different than Philadelphia’s, and in many ways he had become a New Yorker at heart. He misses some things like the vibrant theater scene. His age also made academics a bit harder too. Because he is older than his classmates with far different life experiences than most, at times he has to catch himself in what stories he tells. Ordained a transitional deacon last May, Buffum really enjoyed his deacon year at St. Patrick Parish in Malvern. Right now he is polishing up his master’s thesis on “The Psychological, Social and Spiritual Effects of Media” and looking forward to priestly ordination. The long journey, made more so by a convoluted path, is almost over and a new one will begin. Along the way there have been many, many role models in the priesthood to emulate. In the seminary while studying for Brooklyn there were teachers Father Marc Swartvagher and Father Joe Kelly. In Morton there are Msgr. Savinski and Father Smith, who will be the homilist at David’s first Mass. NEXT: Our man from Assisi: Road to priesthood brings him to Phila.